When you have a moment to catch your breath from all the outdoor and indoor activities of South Lake Tahoe, you might consider exploring some of the region's interesting small Nevada towns. Between Stateline and Carson City there are a number of quaint, sometimes not much more than a wide-spot-in-the-road, small towns. Some may have a rustic café where a few locals and the occasional trucker hang out. Others might have one or two art galleries or antique stores. And once you arrive at Carson City, the capital of Nevada, there are numerous low-key points of interest. The adventurous will find the Kingsbury Grade of Highway 207, a fun drive over Daggett Pass. Once you've descended into the Carson Valley, you'll have a decision to make: take the (more) scenic route left, up Foothill Road, Highway 206, through Genoa, connecting with State 395 N, via Jacks Valley Road, or continue on 207, to Waterloo Lane and Highway 88. Traveling north on 88 brings you to Minden, then Bridge House, and finally Carson City. If you take the scenic route up 206, you'll wind your way to Genoa. 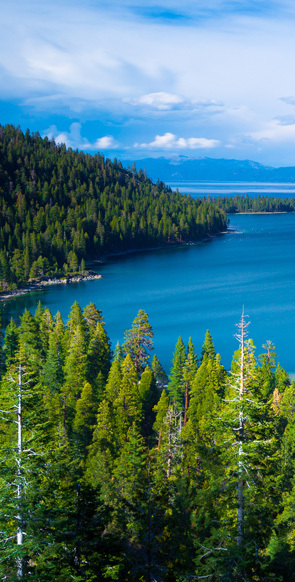 If you decide to drive north on Highway 28, either to circle Lake Tahoe, a popular and satisfying excursion, or to visit Carson City, you'll pass Spooner Lake. Spooner Lake is stocked with trout, has many excellent picnic areas, and is the jumping off point for numerous backcountry trails. Carson City, named for Kit Carson, is about 25 miles from Stateline, and is reached by driving north on Highway 28, to Spooner Lake and then northeast on Highway 50, to State 395. Originally a silver mining boom town benefiting from the 1859 discovery of The Comstock Lode, and a pony express station, it was designated the capital of the Nevada Territory in 1861. Carson City has a number of museums including The Nevada State Museum, The Nevada State Railroad Museum, The Children's Museum of Northern Nevada, and The Nevada State Library & Archives. The Capitol building is open to the public and the central business district downtown features a number of antique stores, art galleries, gift shops, and restaurants. And, yes, there are casinos in Carson City. Most include restaurants, bars, nightclubs, and entertainment.